It’s hard to compete with deep-fried cotton candy. But that’s pretty much what I face each Sunday morning, as the girls plead for a trip to Dunkin’ Doughnuts. So this weekend I pulled out the secret weapon. Prosciutto bits. Like bacon bits, but better. And better than doughnuts. I rule. 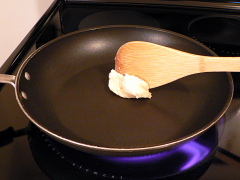 In a non-stick pan over high heat, melt one or two tablespoons of bacon fat. If you don’t already filter and store yours, follow that link. Seriously. It’s good stuff. I used to crack mine into a bowl and stir them before adding to the pan. I finally realized all I was doing was making another bowl and fork that I’d have to wash when I’m done. And doing it this way makes the eggs more interesting anyway — little bits of white mixed in with the yellow. Makes it obvious it’s not some pre-mixed egg-like thing from a box. 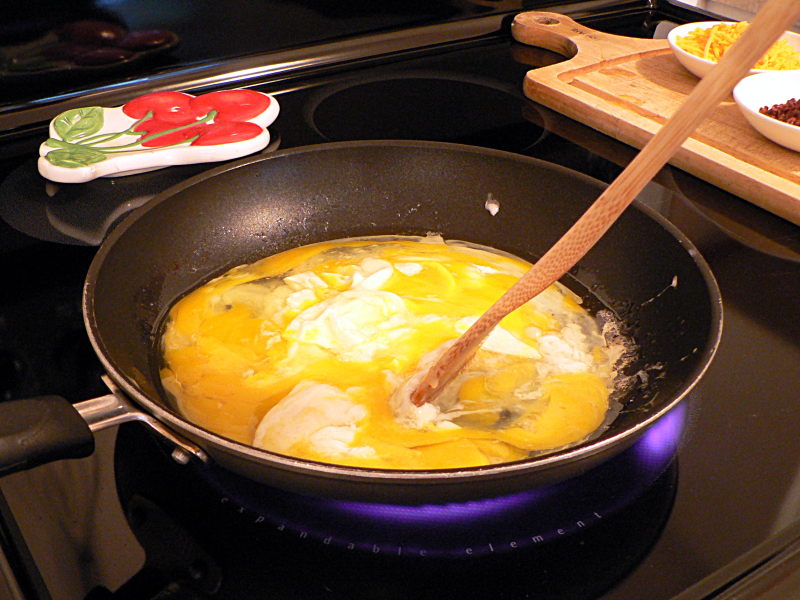 Crack the yolks, if they survived the drop into the pan, and stir everything up. You don’t need to whip it like you’re making an omelet. 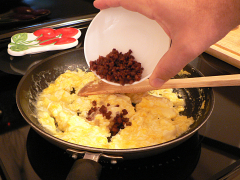 Once the eggs start to firm up, add the prosciutto bits. Stir the cheese in with the eggs. 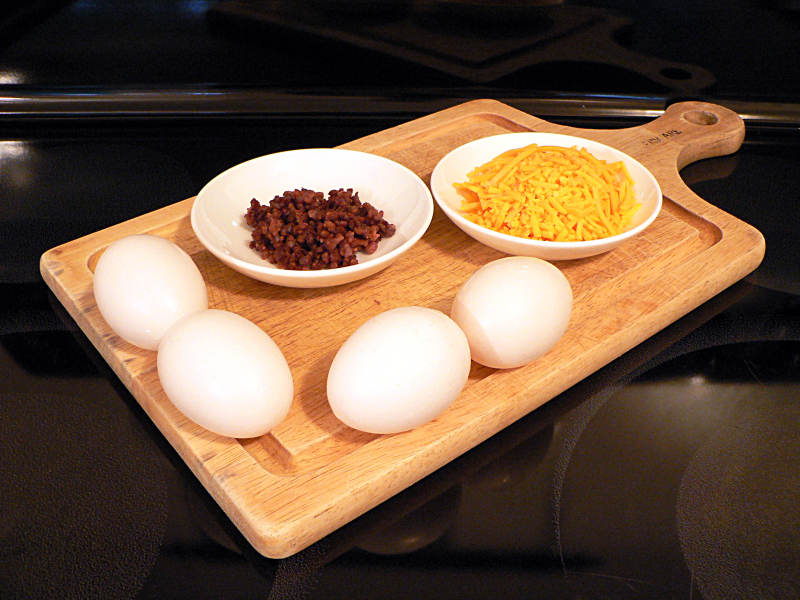 The heat from the eggs should be enough to melt the cheese. You don’t want to leave it on the heat and have the cheese get all runny and separate from the eggs. 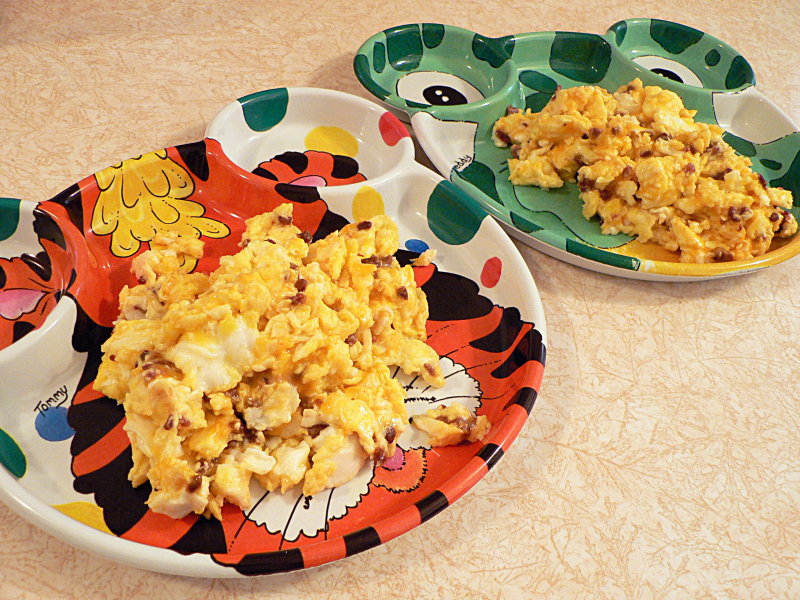 Turn the finished eggs out onto your nicest plates for a classy presentation. Hey, this was for an 8-year-old and a 5-year-old. These are their nicest plates. Unlike my usual advice to clean up immediately, when making this I’ll leave the pan and all the ingredients on the stove. They almost always ask for more. Speaking of eating at home vs. eating out, my 8-year-old realized this weekend that we have chicken tenders, we have apples, we have chocolate milk. She can have a whole kids meal at home. If I can teach them that a home-cooked meal is a treat, and eating out is what you do when you don’t have time for anything good … then I’ll believe I’ve made the world a slightly better place. Melt a couple of tablespoons of bacon fat in a non-stick pan. 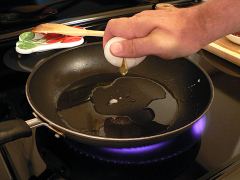 Crack two eggs per person into the pan and stir gently. Cook over medium heat until the eggs start to firm up. Stir add a couple of teaspoons of prosciutto per person and cook until the eggs almost start to look dry. 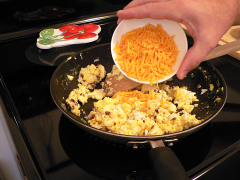 Add a tablespoon of shredded cheese per person, remove from heat and stir in the cheese.